Long lines were present at RSW, as people were trying to get through security on their way home after the holidays. Some lines stretched back to ticket counters, and there are several flight delays. 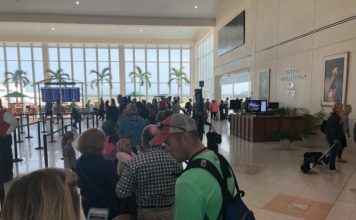 There are no cancellations at Southwest Florida International Airport, but there are 48 delayed flights amid a busy and bustling Saturday of holiday travel after Christmas week. 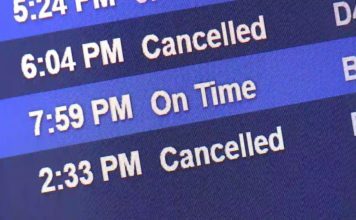 Around the country, there are about 850 flight cancellations. The beginning of the day was busy for travelers catching flights at RSW. But, the afternoon balanced out, and the pace slowed down. “We have this more mid-afternoon flight that we have at least a little bit shorter line than everybody else,” Mosier said. The ease of travel at RSW was a gift for some travelers who didn’t have as smooth of a trip coming into the state. “All the flights coming into Florida were delayed because of the traffic in the air,” said Mosier, who was visiting from Indiana. The traffic didn’t take airports by surprise. Tania Licta said the coordination got her through security on time. The overstuffed airports are keeping every department on it’s toes, and this comes during a time when TSA agents are not being paid because of the partial government shutdown. Keep checking your flight status if you are traveling this weekend. “They did a great job everyone in the airport from coffee to clean up … the crew did a great great job,” Licata said.